I used a wooden box as my base for this shadowbox. It's covered with vintage floral wallpaper and old sheet music from hymnals. The sheet music songs I chose are "The Beacon Light", "Softly Now The Light Of Day", and "O Come, Let Us Sing". The doll head is an exquisite porcelain low brow doll, her body is a cone that I covered with bits of wallpaper pieces from my stash......then I added a crocheted collar and angel wings to her. I also made her a hat with velvet trim, a white pom pom, and attached a sweet little bird. This box is also finished on the back with vintage wallpaper (see last photo). There are two pink dresden pieces in the lower corners and a row of double tatting at the top. 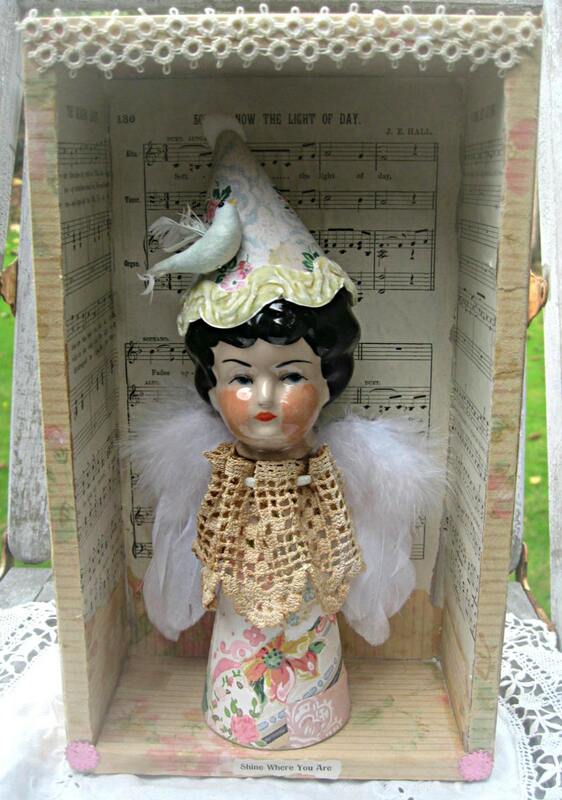 This is a OOAK assemblage that won't be repeated and it will be signed on the back. The message at the bottom, "Shine Where You Are" is taken from an old hymnal. I love that advice! Measures 7 1/2" across, 3 1/2" deep, and stands 12 1/4" high. This piece is meant to stand on it's own but if you wanted to add hanging equipment onto the back that should be easy enough to do.